Manistee is one of Michigan’s most popular fishing towns. Throughout the year anglers have a variety of fish species to choose from, but once August rolls around it seems as if the community comes alive. Charter boats are running trips almost every day, hundreds of pleasure and tournament fishing boats pour into Lake Michigan and the Manistee harbor, and river anglers make their way upstream by boat and in waders. Being a die-hard angler, it’s the community atmosphere I live for! August started out fairly slow this year. Fishing out of Manistee on Lake Michigan was tough for most anglers. The first week was decent, as we managed several double-digit boxes of adult Kings. After that first week, it seemed to slow down. Mid way through the month, we got a hard north wind which flipped the water. After the water flip, cold water came close to the river mouths and the harbor fishing was on fire! 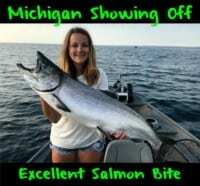 We were getting good numbers of big adult kings, pier anglers were getting salmon and river anglers were happy as the Manistee River got a good run of fish too. Once our big lake charters slowed down, it was time for me to hit the river, as I knew there was enough fish for me to chase around after the water flip. The last couple weeks have been fairly consistent for us in the rivers, particularly the Manistee. Although we haven’t had a water flip since mid-August and the water temperatures are in the upper 60’s right now, each time we get a decent rain it seems to push a fresh pod of kings up the river. 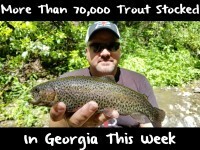 Even though we’ve been seeing some good fishing already, the peak of the salmon run is yet to come. I believe until we get a good north wind to really flip that waters we’re just going to keep seeing small spurts of pushing salmon. Once the north wind comes, it would definitely be worth your time to head to a west Michigan river or pier! My favorite method to use off the pier is casting glow spoons at night, and live alewife on bait rigs and crank baits during the day. These methods hold consistent throughout the year on the pier. In the river, it started out as a stick bait bite mid-August. Fire Tiger and rainbow trout were my top colors. Once the last weekend in August rolled around, it switched to a major skein bite! Lately, we haven’t been able to use anything but skein because it’s had us hooked up all day almost every trip. I believe the skein bite is going to be solid for the next two-three weeks, then it may switch over to a spawn bag/bead bite, similar to last year. Once this happens, steelhead should start making an appearance throughout Western Michigan streams. Keep in mind, all my skein is cured in Pautzke FireCure and BorX O Fire. We covered how to cure in my blog last week, which is shown below. Good luck to everyone on the water! This is the time of year that I live for! 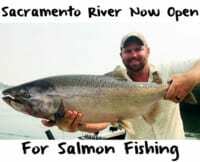 Salmon fishing is in full swing and steelhead are just around the corner! Whether you troll, fish the pier, or river fish, make sure to get out and enjoy the great fishing opportunities that are available here in the Great Lakes region!